My husband, who has a knack of finding hidden gems, suggested one day that we try a new place for brunch on Sunday. He had heard of this particular spot as it was named in a survey has one of the Top 10 urban brunch spots in the United States. After looking at the restaurant’s website and seeing a sample brunch menu, I figured it seemed pretty decent. I was curious in the fact that the restaurant was in a part of town that I’d rarely been to, and even when I have been there its only been to drive through the community, but had much been interested in. From what I understand, this neighborhood, known as Silver Lake, is a young, up and coming neighborhood filled with independent boutiques, coffee shops and restaurants. 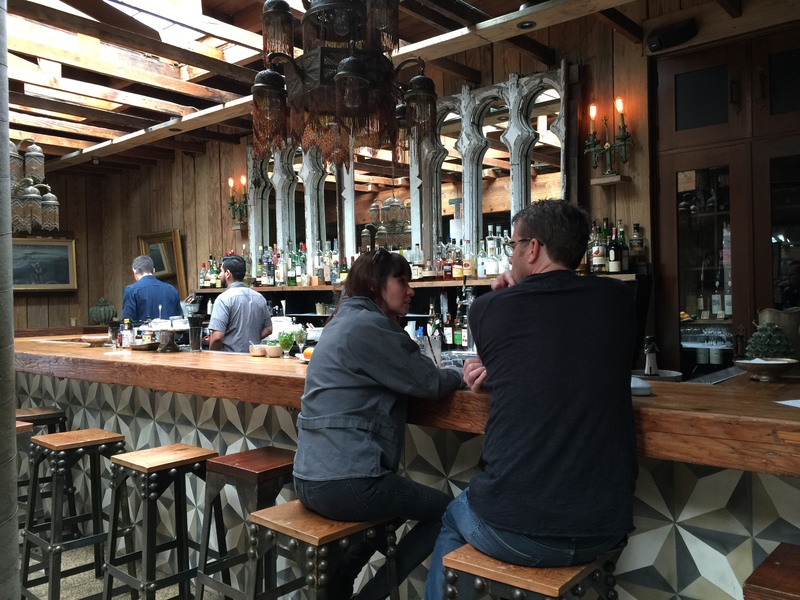 In the early 2000s, Silver Lake, experienced gentrification, and since then the community has drawn young professionals and a wide, ethnically-diverse population. 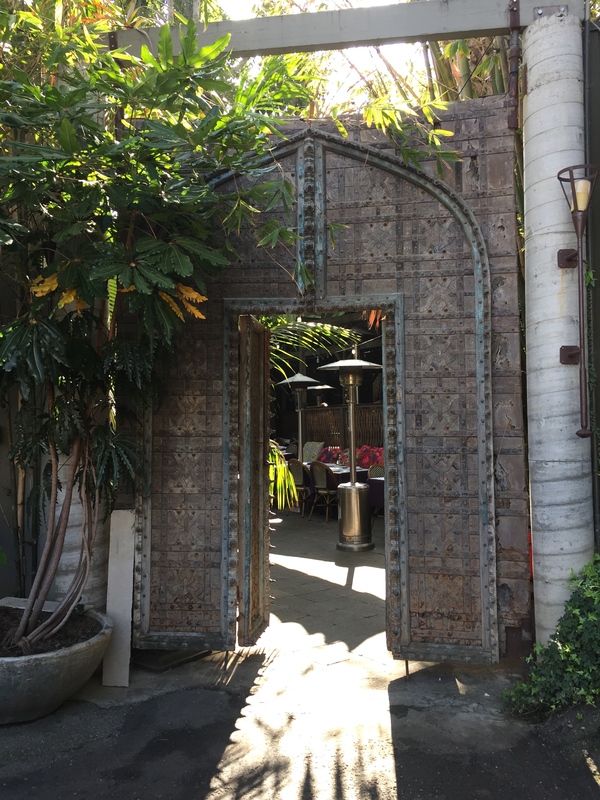 On the weekends, Cliff’s Edge is jam packed with the brunch crowd who dine al fresco on the restaurant’s outdoor patio under the shade of the ancient tree and take advantage of Los Angeles’ nearly year-long sunshine. 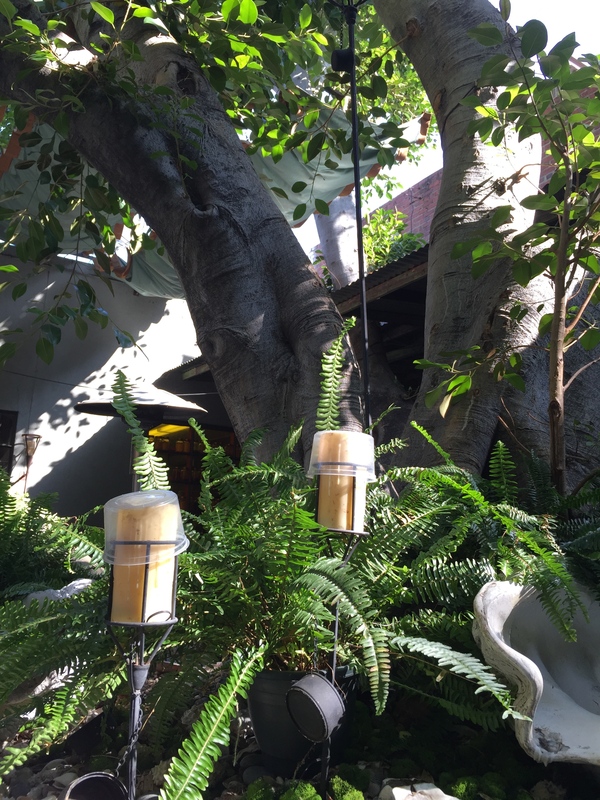 The outdoor patio takes advantage of the areas local greenery to create an inviting atmosphere that makes you forget that you’re even in Los Angeles right along busy Sunset Blvd. 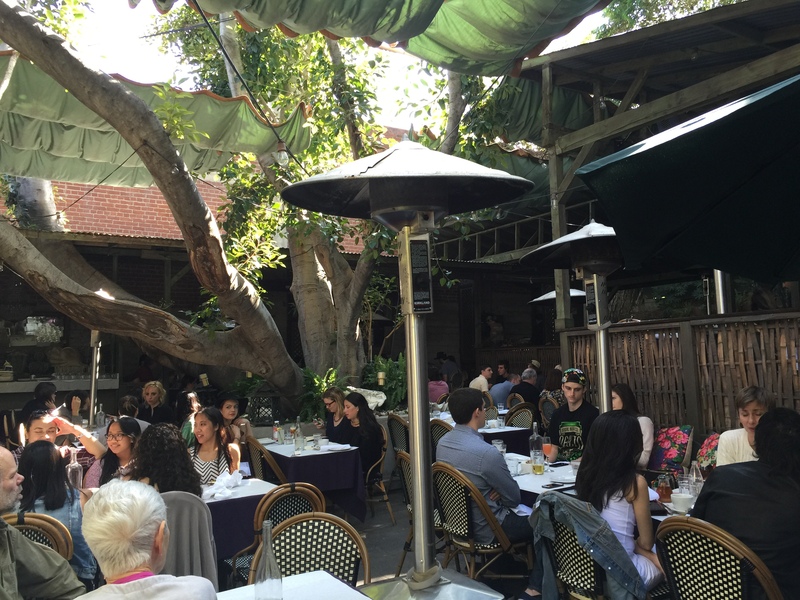 In fact, this outdoor patio was named in Los Angeles Magazine’s list of the Best of Los Angeles as the Best Patio in 2014. Stepping into the Cliff’s Edge patio, you quickly feel like you’ve been transported to a new world. I’d describe as dining in an adult treehouse. Brunch calls for a morning coffee drink. Normally, I’m not big on ordering coffee at restaurants, as I figure I can get my coffee fix at Starbucks. But, soda seems not appropriate so early in the morning, and my husband wasn’t interested in a morning cocktail, so I went with a cafe latte. 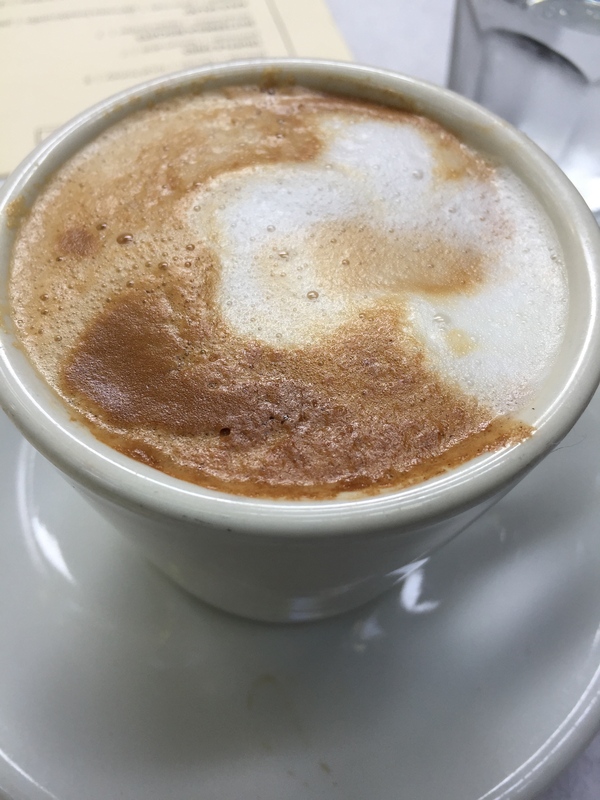 This little cup of espresso topped with steamed, frothy milk was quite the eye-opening pick me up. Hot and extremely strong, this was probably one of the strongest latte’s I’ve had. While good, I probably could have done with a little bit more sweetness (though I didn’t bother to ask for sugar) and something a little less strong. But that’s more personal preference than anything. The strength of the latte certainly didn’t keep me from finishing my drink. My husband started his meal with one of the restaurant’s most popular dishes, and one of the dishes mentioned in the article where Cliff’s Edge was named one of America’s Best Urban Brunch Spots, the lemon and ricotta pancakes. Topped with honey blueberry sauce, these pancakes were fantastic. My husband probably fell in love with it at first sight, he can’t resist the view of all that blueberry sauce! But at first bite, he was hooked. Hot off the griddle the lemon ricotta pancakes were fantastic. The pancakes were perfectly cooked with a terrific fluffy quality to them. They tasted of fresh lemon and I’m pretty sure the batter used both lemon juice and lemon zest. The lemon taste and flavor was present in every bite, but not too strong and not too much. The lemon essence was just perfect. The ricotta in the pancakes could be seen, and tasted, interspersed into the pancake batter. So every few bites you could see the ricotta and taste its creamy goodness, it was a great contrast to the lemon flavor. The pancakes were much larger than we expected them to be, and had we known it was this big of an order, we probably would have shared the dish as my husband was full just trying to finish the pancakes. 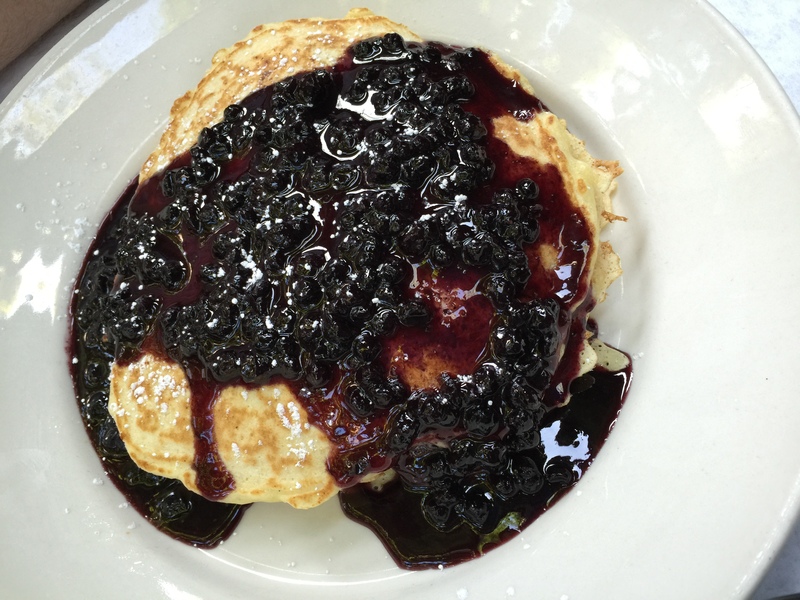 My husband loved the honey blueberry sauce and felt that the pancakes were much better with the sauce. And though I don’t like blueberries, I had to agree. The combination of the slightly sweet honey blueberry sauce with the tang and acidity of the lemon paired together perfectly. The sauce itself was packed with actual blueberries and not just blueberry juice, and my husband whose favorite food is blueberries absolutely gobbled the whole thing up. I started my meal with a salad of frisee lardon. Frisee greens tossed in a red wine vinaigrette topped with bacon lardons, chives and garlic croutons is finished off with a poached egg. First off, the poached egg is perfectly poached, the egg whites are soft and firm on the outside and the yolk is runny and creamy on the inside. Cut open the poached egg and let the yolk run out over the salad and it creates just another level of flavor to the salad that’s just perfect. The lardons a great protein for the salad. Instead of bacon which can be too crispy and salty, the lardons have more body and are thicker, almost like thick cut pancetta, and they aren’t quite as salty as bacon would be. 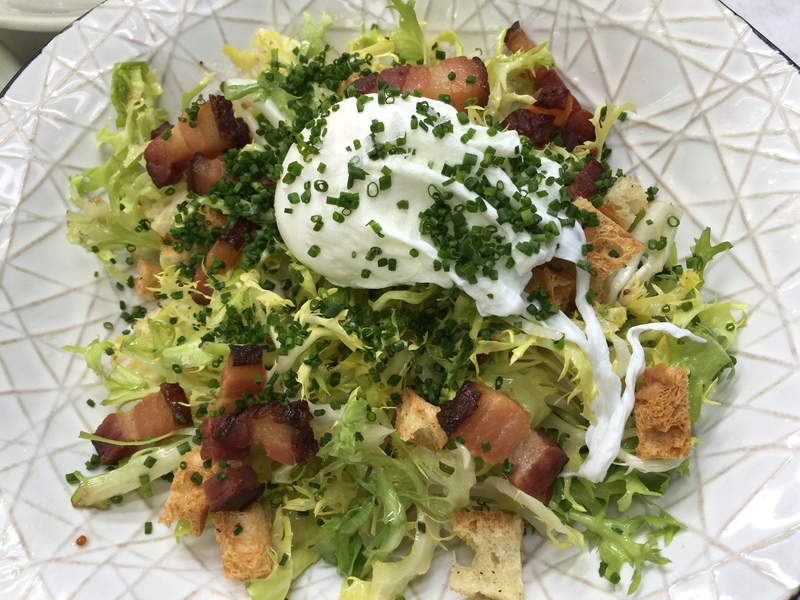 The lardon combined with the egg yolk add a nice flavor and texture combo to the salad. I’m a huge fan of croutons, in fact, the more croutons the better, in my opinion, and these garlic croutons are terrific. The slight garlic hint to them adds just another level of flavor and they actually balance the chopped chives and their onion flavor quite well. For a starter, I liked the idea of frisee, it was nice and light and slightly bitter in taste, which is how it should be. It was crisp and fresh, too, which really shined through. My one complaint with this salad was in the red wine vinaigrette and that it was just too overpowering and a little bit too much. First off, there was lots of vinaigrette, and while I love salad dressing, this was drowning just a bit. When there’s also poached egg with a delicious egg yolk, you just don’t need that much vinaigrette. Secondly, the red wine vinaigrette packed such a flavor punch that it overpowered all the other flavors in the salad. There was so much acidity and vinegar to the vinaigrette that the creamy, sweet flavor of the egg yolk, and the garlic in the croutons and even the slight saltiness in the lardons was getting lost in it all. For our entrée, it wasn’t a surprise to me at all that my husband ordered the eggs Benedict. He’s a sucker for Benedict and will order it whenever he sees it on the menu. 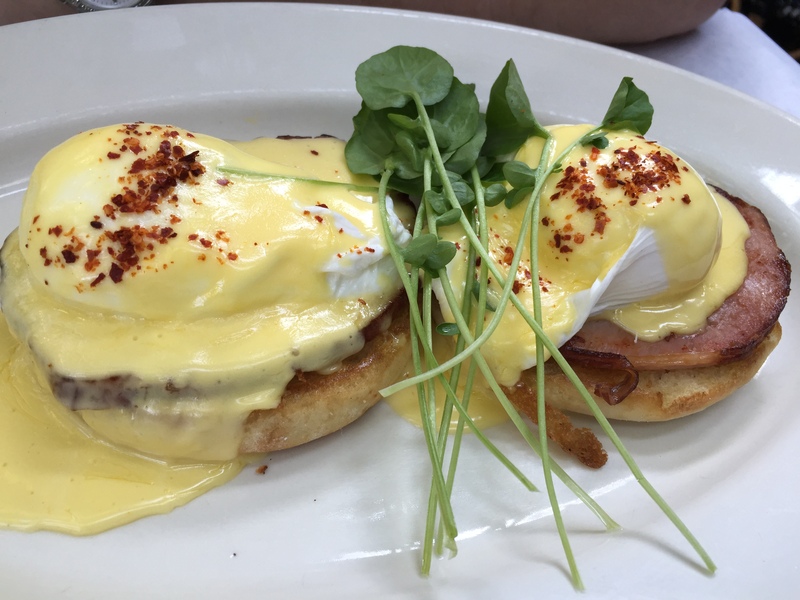 Eggs Benedict at Cliff’s Edge is made with poached eggs on top of prime smoked meats Canadian bacon and finished with Hollandaise sauce. My husband devoured his eggs Benedict, and I never took a bite, so I’m going to assume he liked it well enough. My husband said that the Canadian bacon had great flavor, and what he really liked about it is that it was thick, so there was lots of good flavor to it. And for the guy that doesn’t like sauce generally on anything, he really liked this Hollandaise sauce. There was a sprinkling of what we think is a bit of paprika over the top of the eggs Benedict, which gave the Hollandaise sauce that extra little oomph of flavor. Overall, the eggs Benedict was quite flavorful and filling. With my entrée, I went a bit of a different route ordering the pork belly hash. I’ll admit that what was brought out to the table was not exactly what I pictured when I ordered pork belly hash. I was thinking a dry, crispy, crunchy pork belly hash. What I was served was almost a bit more like a stew for hash, it was certainly not crispy and crunchy. That doesn’t mean it wasn’t good. 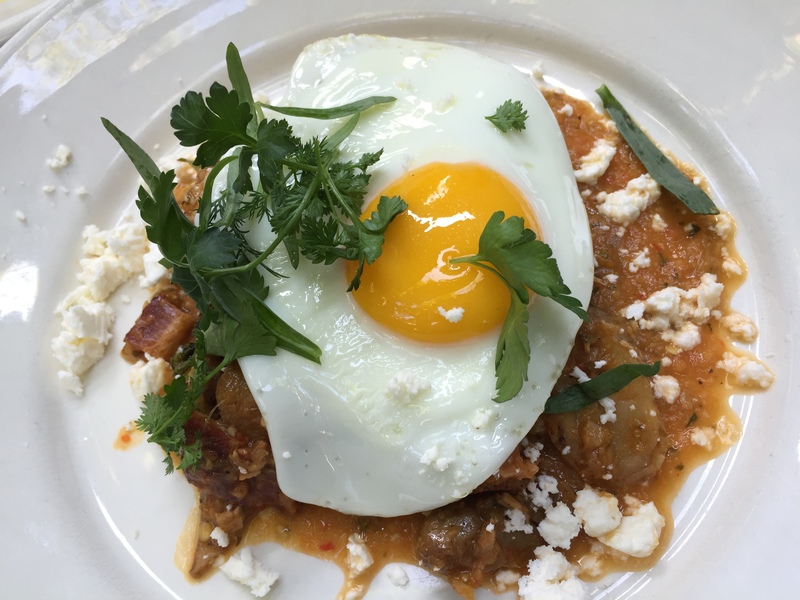 The pork belly hash was made with bacon, potatoes, Brussel sprouts, herbs, feta cheese and all topped with a fried egg. Again, the addition of the egg atop the hash was quite interesting, and quite tasty. I liked it, especially when you cut it all up and mix it into the hash. The hash was incredibly flavorful and the pork belly was tender, and delicious. I loved it. The combination with the potatoes, which just soaked up all of the flavors, and the addition of Brussel sprouts which added a great fresh vegetable flavor was terrific. The idea of using feta was interesting. I would never have thought of feta for this dish, but in the end the salty flavor of the feta actually worked in the hash to add flavor. The one thing I didn’t expect about the hash was that it was quite spicy, almost a bit too spicy for my taste, almost. But I pushed through, because the flavors of the vegetables and the hint of salt from the feta helped cut down on the spice in the hash. Not quite what I was originally expecting, but still tasty none the less. As if we hadn’t had enough to eat for brunch, my husband and I can’t pass up a good dessert. It would be blasphemous to not at least browse through the dessert menu. So, of course, we just had to try something. We decided to split the Valrhona chocolate tart. 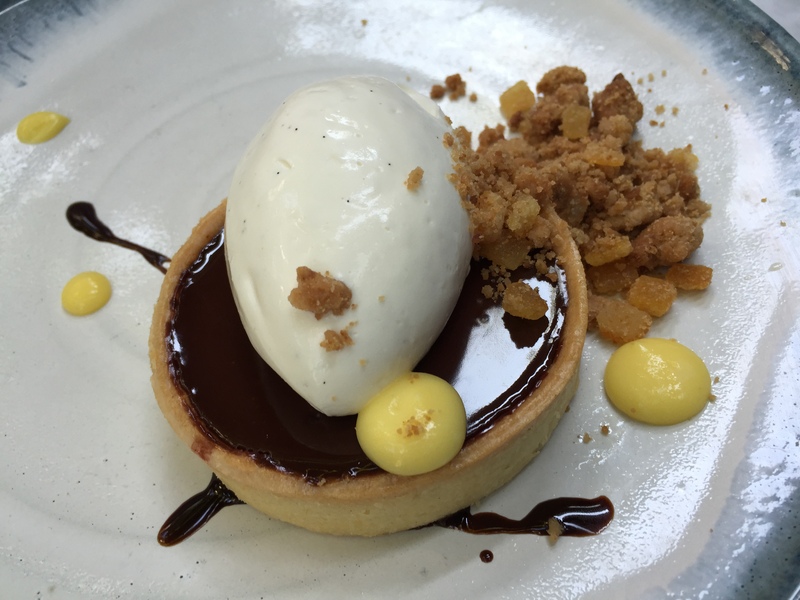 The tart is made with dark chocolate ganache inside the tart shell, topped with chocolate orange crumble, orange curd, coffee sauce and homemade whipped cream. First off, the chocolate orange crumble and the orange curd are fantastic. It’s almost like having candied orange, and the flavor of the orange with the dark chocolate ganache is perfect. Orange and chocolate pair perfectly together. The tart shell is actually quite flaky and buttery with a great taste that isn’t dry. The dark chocolate ganache is silky and smooth, almost mousse-like, which means that it stands up inside the tart shell and isn’t this runny mess. The homemade whipped cream actually adds just the hint of sweetness that the dark chocolate needs so that it isn’t too bitter in flavor. I’m not the biggest fan of tarts, but I must say that the flavor combinations in this tart, especially the chocolate and orange are en pointe and incredibly tasty without being too sweet. My husband and I left Cliff’s Edge completely satisfied with our brunch. 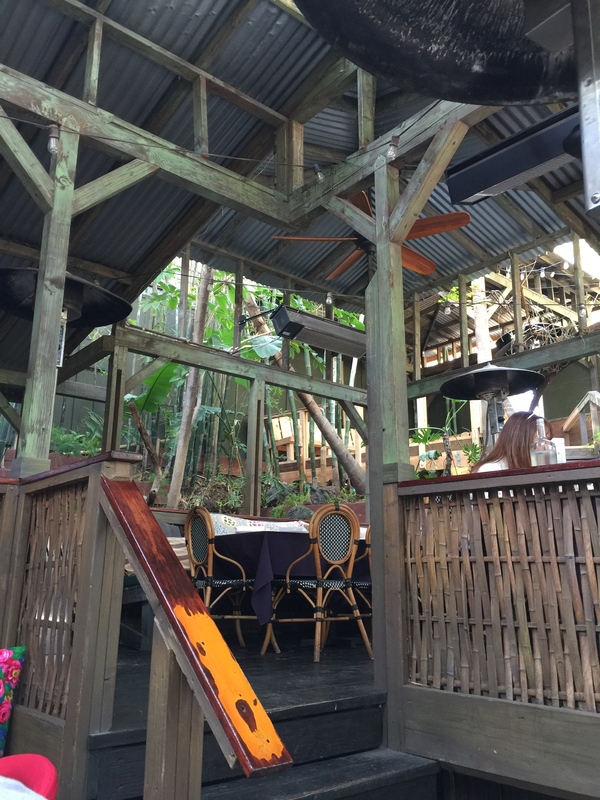 While the location of the restaurant is a bit funky and located next to a 99 cent only store, and the parking is a bit of a hassle, the restaurant itself is like an oasis in the desert. When you walk through the doors of the restaurant, you’re transported to a completely new world. You would never imagine that you were in the urban jungle of Los Angeles. Instead, it feels like walking into a bit of a tree house atmosphere. You almost feel like you’re dining in an adult tree house, that’s exactly how I described it to friends. Brunch is a perfect way to enjoy, and appreciate, Cliff’s Edge’s outdoor dining patio. And their menu is creative, fun, and really delicious. The lemon and ricotta pancakes are a true winner, and my husband and I were satisfied with everything we ordered. I definitely see why Cliff’s Edge was named one of the Top 10 urban brunch spots in the United States. You’d never guess that you’re only a stone’s through from the concrete and glass jungle of the downtown Los Angeles high rises. This funky little restaurant is in winner that fits in perfectly with the funky and eclectic neighborhood of Silver Lake. I recommended the restaurant to some of my co-workers the following day at work, and I know that one of my coworkers was interested enough that she decided to give Cliff’s Edge a try. I’m happy to say that she too enjoyed their terrific food and wonderful atmosphere. I don’t often find myself in that part of town, but I would definitely eat at Cliff’s Edge again if I’m ever in the neighborhood.